FCCB #259 - Back To School! For my project this week I created some lunch box notes for my 8 year old daughter who is going into Grade 3! 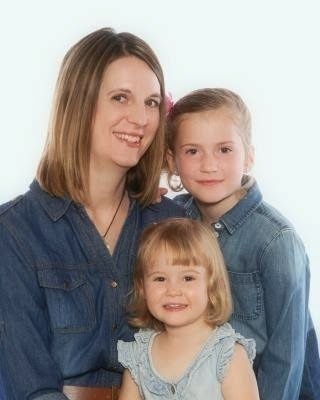 I can't believe it!! Last September I started off the year making a few notes - well she loved them so much and was so disappointed when she didn't get one that I ended up giving her one everyday! She actually keeps them all and looks through them quite often :) Something little that makes her that happy actually makes it worth it, but I just realized I'd better get working on getting these babies stockpiled! School Supply Set for all the fun school supplies on the cards. I used some stencils and Distress Inks to stencil in some backgrounds on my card bases and even used the Write feature for the quote - love that feature! I used Prismacolor Markers to shade my cuts to add a realistic shaded look to them before adding them on the square backgrounds. 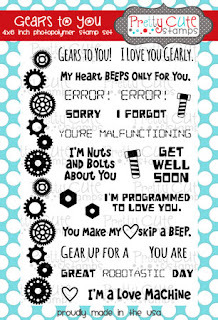 On the back I always write a little note to my daughter, but I also wanted to include some of the Small Talk stickers from Tim Holtz - great quotes! Thanks so much for joining me today! 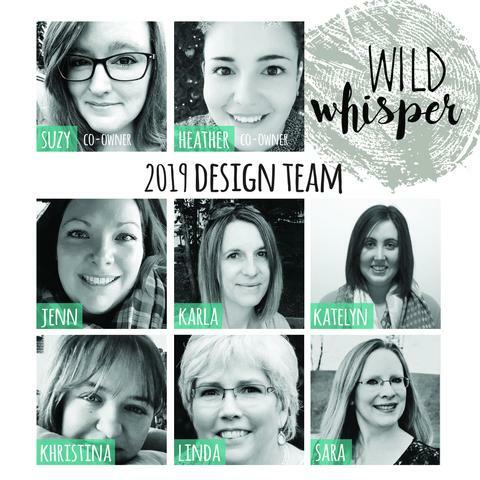 I can't wait for you to check out what all the other Design Team members have come up with too on the Fantabulous Cricut blog! 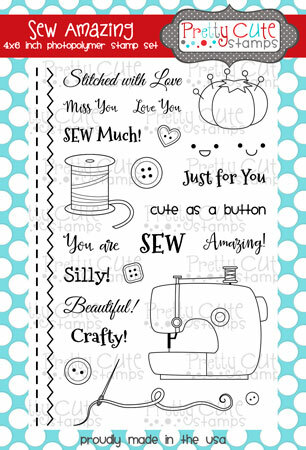 Don't forget to enter your own project for a chance to win a wonderful prize - just make sure you have at least 1 Cricut cut and let us know what cartridge you used. Plus you get an extra entry for any projects that are not a card - how cool is that?!! 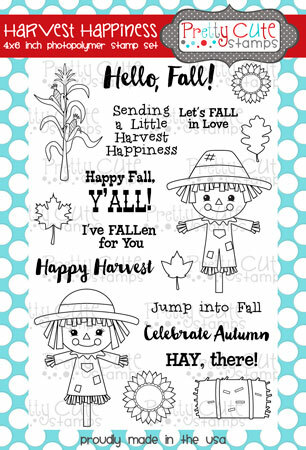 Well, it really is still technically summer, but we have evidence of the fall season all around us - school is back this week, the leaves are just hinting at turning golden yellow and there are so many cute fall stamps and papercrafting products that it's hard not to get just a wee bit excited! I love this sweet sentiment in the set that I stamped on the front of my card - and I felt like this scarecrow couple just needed to share their love! The zig zag stitching was done with the stamp from the Sew Amazing set - it made the perfect outline around the border of my background, and the heart comes from that set too. I used some Perfect Pearls mist to spritz a bit of shimmer onto my card after I had everything placed where I wanted. I coloured the images in with Prismacolor Markers after stamping on white cardstock I used a black pen to add some vines to the pumpkins, added some glittery Stickles and used foam dots to pop up some elements on the card. I used the pumpkins from the Little Pumpkins set - one of my Fall 'must have' sets! Inside, I stamped another sentiment inside a pumpkin, added another heart button and one of these awesome cornstalk stamps. Thanks so much for stopping by today to check out what I've been working on! 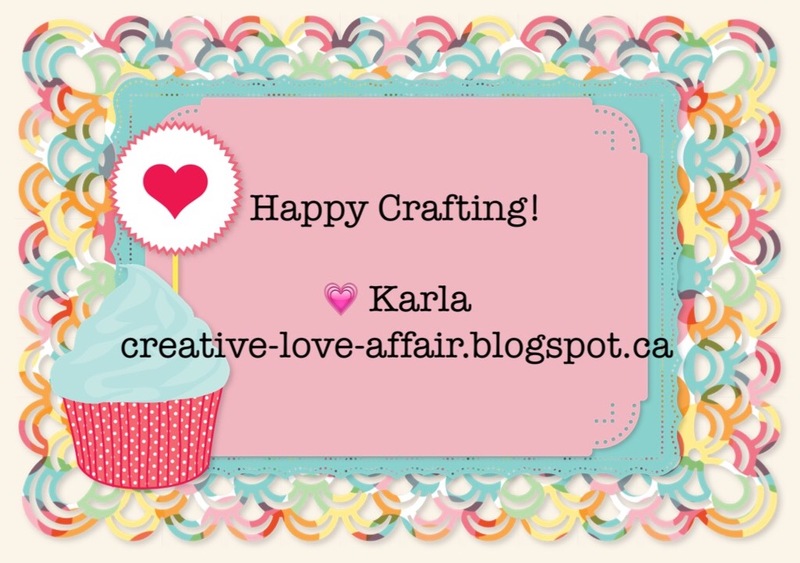 I hope you have a lovely, happy, crafty week!! Sooooo, I've finally picked myself up a really sweet 365 planner from Me And My Big Ideas! I've been seeing all the adorable ideas around the papercrafting world, and since I do like to use a paper planner for some things and thought I'd give it a go! 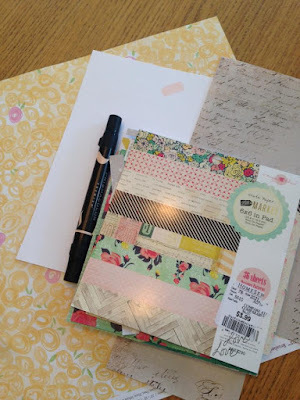 I love that I can use the supplies I already have on hand for scrapbooking and cardmaking to decorate my planner. This planner starts in July, but since I picked it up last week that's where I started it! I recently downloaded a colouring sheet from the Wild Olive blog (so cute!) and I coloured the images with Prismacolor Markers and cut them out to use in my planner this week. You can find the download here! I simply used some tacky glue to stick them on the pages. Here are closeups of both pages. I do find I actually get around to doing things like booking appointments when I have them written down. I wasn't sure what day we were going to do the lemonade stand, so I put it on a sticky note. I also used a couple stamps from the Crazy Birds accessories and sentiments on my page and coloured them in with coloured pencils. As well as the colouring sheet, I raided my camping scrapbook sticker stash. Since I knew we were going camping all four days I didn't worry too much about specific planned entries and just decorated. I went back after and entered a few things in, more so I would remember when I worked on scrapbook and Project Life pages! We made a trip to the Dollarama store to pick up some 'planner accessories' - coloured pens, black pens and matching pencils, sticky notes and paperclips. She picked up an alternate cover for her planner - so sweet. Of course, we used 40% Michaels coupons for all this! Thanks so much for joining me today! 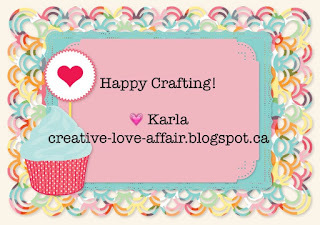 I hope you have a lovely, organized week and I hope this inspires you to find more ways to use your crafty supplies! I'm posting today over at the Scrapping Everyday Miracles blog and I'm sharing this Prima Doll Tag as a tutorial! I first started by cutting a tag the size I wanted and then pulled out some stencils and Distress Inks. I used more Distress Ink in Tumbled Glass and a Tim Holtz butterfly stamp to stamp a light image on the bottom left of my tag. For my ribbon I used some seam binding ribbon and rubbed Distress Stains directly onto it, then I spritzed lightly with water and crumpled the ribbon with my fingers before drying with my heat gun. This blends some of the colours and crinkles it nicely. 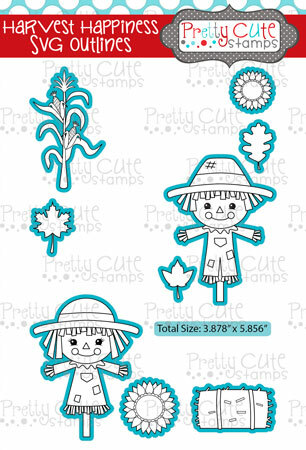 Now, it was time to create the Prima Paper Doll that I wanted to use on the tag! I'm really liking the way these dolls look stamped on a script paper, so I stamped my doll directly onto the script paper shown in the picture below and then used a light peach Prismacolor Marker, which is alcohol based, to colour in the face and skin areas. I used the yellow floral paper, from the CTMH Brushed Paper Collection to paper piece her hair and paper from the Crate Paper Flea Market Maggie Holmes paper pad for her clothes. I also used journaling cards from the Picture My Life CTMH Skylark Collection to layer behind the doll. I added some paper flowers and gems to my tag and a couple layers of ribbon along the bottom of the tag. I wanted to add a quote, so I used the Tim Holtz Small Talk stickers, cut apart to fit inside a frame I diecut with a Spellbinder's Die. I traced around the quote with a black pen and added a heart sequin to finish it off. I love this quote - it reminds me that my day is so much better when I take a few minutes to think of what I'm thankful for first thing in the morning. Then, instead of focusing on anything that might be negative I'm feeling happy about those big and little things that make life amazing! Thanks so much for joining me today! 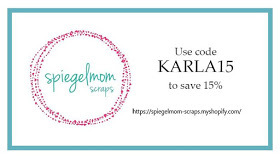 Don't forget to stop over to the Scrapping Everyday Miracles blog to see all the amazing posts this month and join in our awesome challenges for your chance to win a prize!! You still have a few more days left to enter your project! Today I'm sharing this mixed media bookmark over at the Scrapendipity Way Of Life blog. Recently I joined a swap where a group of ladies made papercrafted items and swapped them. I made these bookmarks for my project! I started off with a piece of cardstock that came in the size of a bookmark, but you could simply cut the size you'd like. Then, I Mod Podged on a pattern piece - you can find old patterns at most second hand stores and they're great for this! I used Dylusions Spray Mists to spray on a yellow and pink background, which combined to create the orange in the middle - so cool! I used some stitching stamps and black ink to stamp directly on my background and then stamped and heat embossed the flower and dressform images. Of course I had to use some Distress Sprays to spritz my seam binding ribbon and then put it through a hole I punched with my Crop-O-Dile and added an eyelet to. On the back I stamped a fun stamp with some Kaleidoscope Ink to create a graduated green image and signed the bottom. 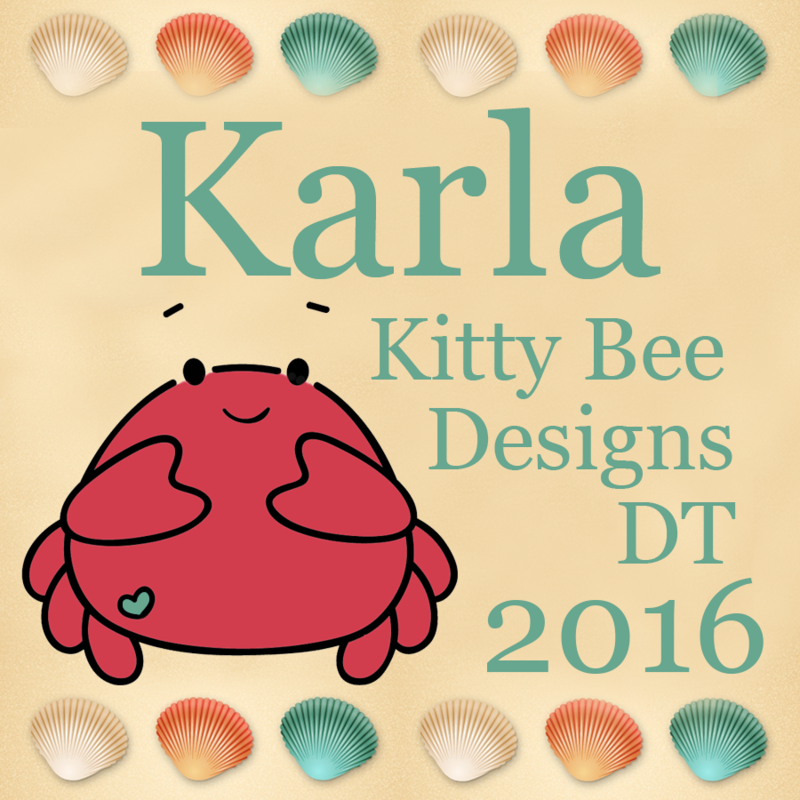 I am so super excited to be a Guest Designer on the Die Cuttin' Divas blog today!! The theme for the challenge this week is Celebrate It! 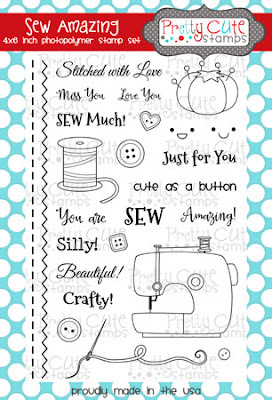 so I thought these Miss Kate's Cuttables SVG files were the perfect start to a celebratory project :) As well, I'm posting at the Scrapendipity Way Of Life blog today. 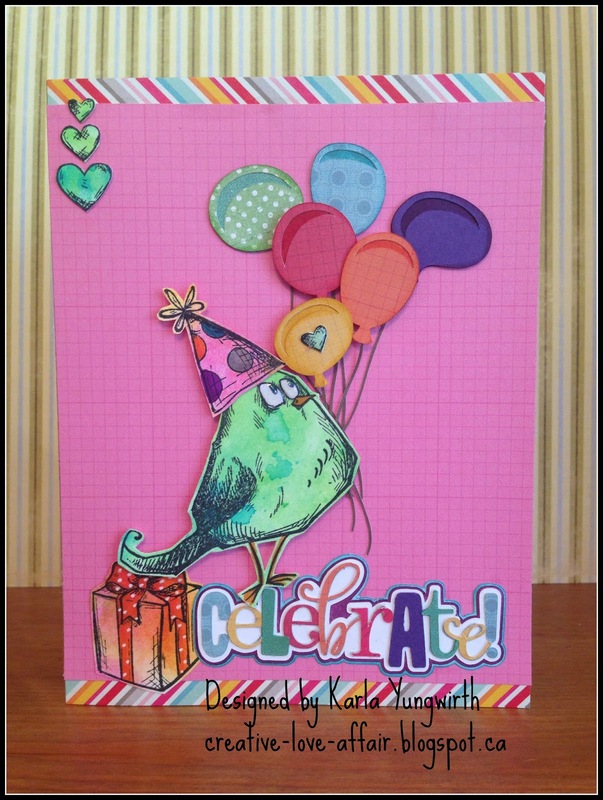 I finally picked up a Crazy Birds stamps by Tim Holtz along with the coordinating accessories and sentiments from the Scrapendipity Truck - so what better time to combine these fun stamps with some awesome diecuts?!! I used my 6x6 paper pads to diecut the balloons and title with my Cricut Explore. I absolutely love how precise the cut is with the Explore! I know my blade should probably be changed, but it still cut these thin balloon strings wonderfully. I layered the balloons on some pink Simple Stories paper, popping some up with foam dots to give dimension. I actually cut both layers of balloons in the same colour and then used an alcohol marker to shade in the base to save time. I had some watercolour backgrounds that I've been working on and thought these would be perfect for stamping this cute Crazy Bird, the hearts, his hat and the present on. After stamping I added in some shading details with Prismacolor Markers and used Glossy Accents on his little eyeballs and the heart on the balloon. I added some white gel pen to the ribbon on the present and popped up the bird to look like he was standing on this cool title. Inside, I added one of the great sentiments from the set and a couple more hearts. I am sure enjoying summer, but these Little Pumpkins are really making me look forward to fall! They are so happy and cute with these adorable faces you can mix and match - how can you not smile when you look at these guys?!! I pulled out some papers from my 6x6 paper pads to use on this card as well as using a Spellbinders frame diecut which I cut from watercolour paper. I used some Distress Inks on the frame and then spritzed with Perfect Pearls spray mist to blend the colours and give it a shimmery look. I stamped the pumpkins on various orange patterned papers from my stash, added the faces, and used Prismacolor Markers and a white gel pen to colour in the face and stems. I chose a Happy Halloween sentiment for my card - I'm sure a friend is going to love it when Halloween comes around! I used some of the star stamps from the Superheroes set! Thanks so much for joining me today!! 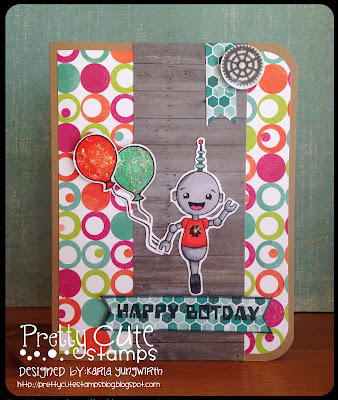 Be sure to check out the Pretty Cute Stamps blog to see all the amazing projects over there right now as well as our current challenge going on right now! 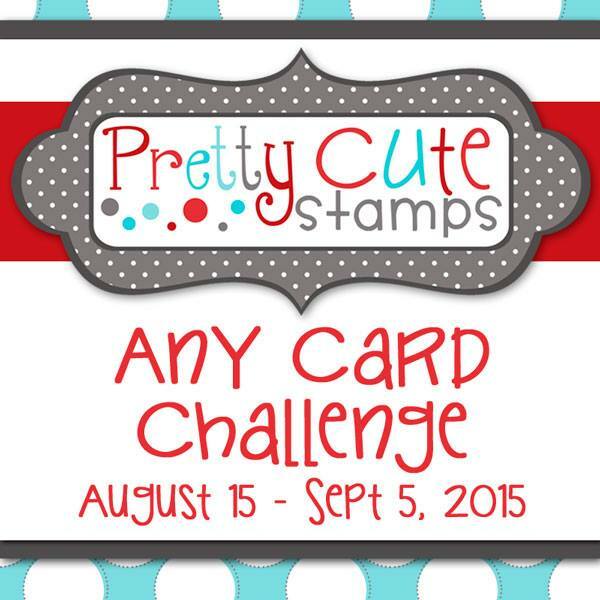 Pretty Cute Stamps Challenge - Any Card! Yay! 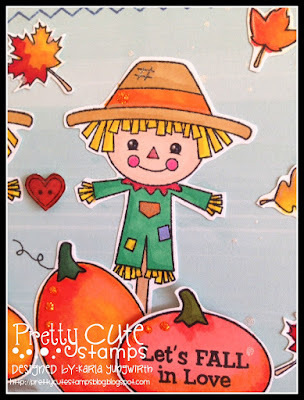 Time for another challenge over at the Pretty Cute Stamps blog! 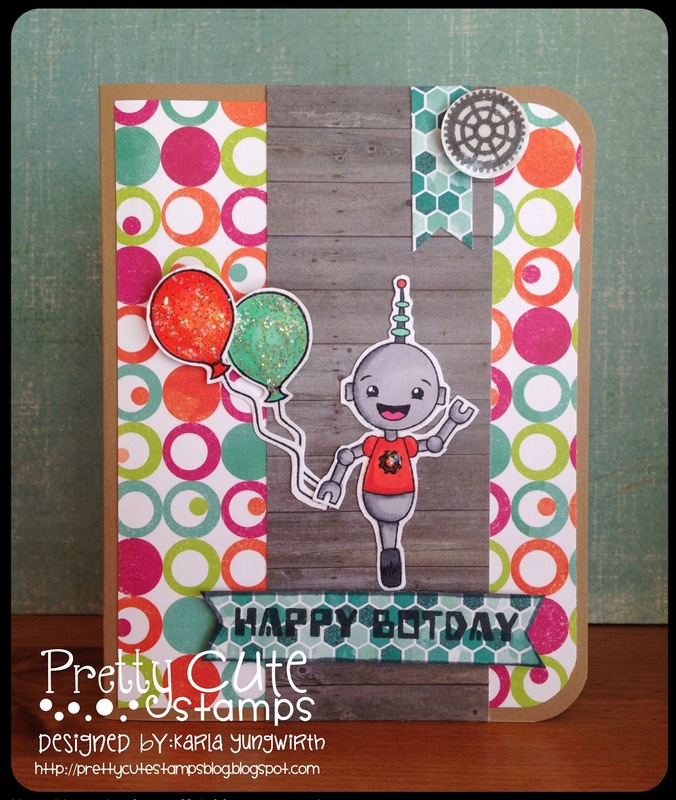 This month our challenge is to use a Pretty Cute Stamps stamp to create a card! For my project I've decided to create this awesome robot birthday card using the BOTday and Gears To You stamp sets! 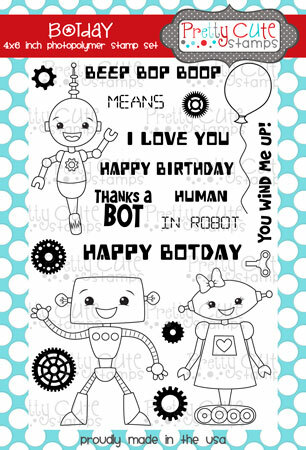 They are such great sets, and there are so many options with all the great sentiments! Thanks so much for joining me today, and don't forget to check out the amazing projects all the rest of the Design Team has come up with! 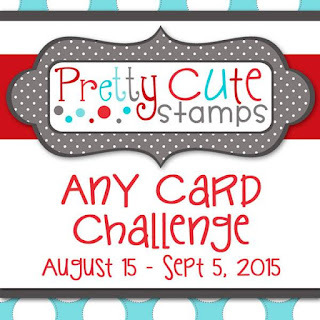 You have until September 5th to enter your own card using a Pretty Cute Stamps image into the challenge for a chance to win an awesome prize! I hope you are having as great a week as I am!! 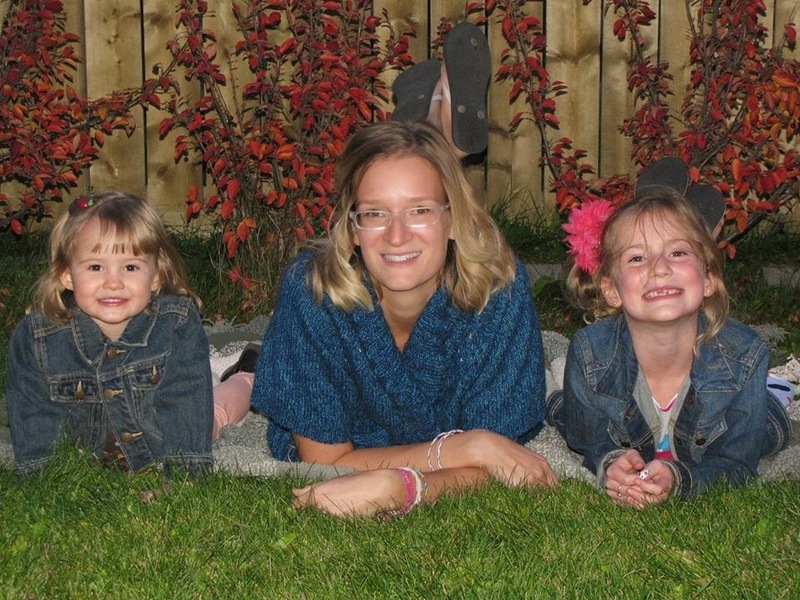 We are having some lovely hot weather here in Alberta this week - so nice to enjoy especially as back to school is not that far away! 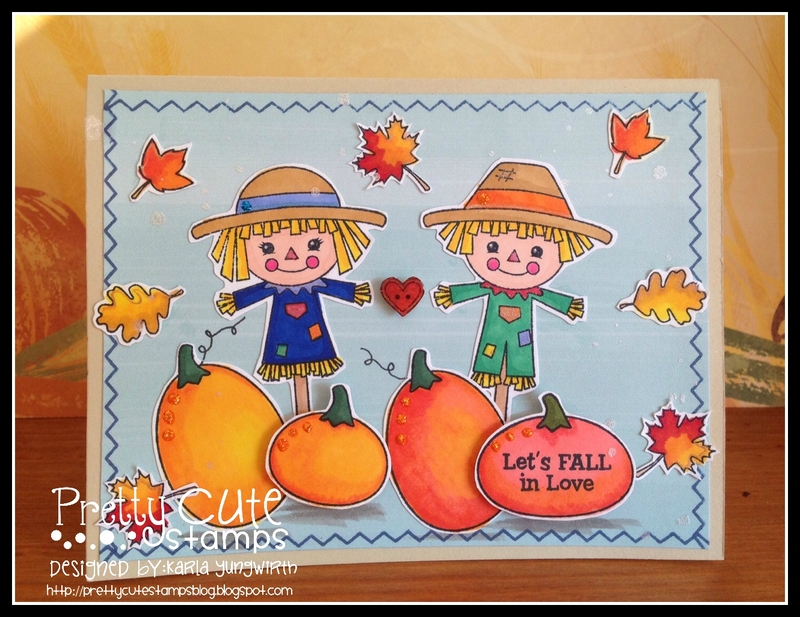 Today I'm posting for the Pretty Cute Stamps blog with a very cute fall card using the Harvest Happiness stamp set! 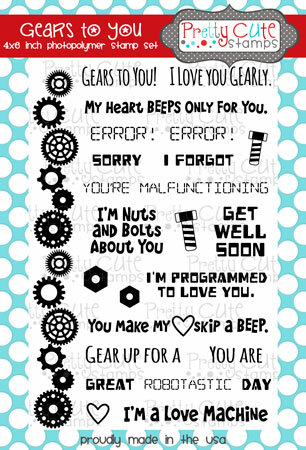 I am so excited to have this set :) There are so many sweet elements to this and of course I love all the wonderful sentiments! I used Distress Inks to blend a background using blues on top and yellows on the bottom. Then, I added in my stamped images, which I coloured in with Prismacolor Markers. The sunflowers are popped up with foam dots and I used Stickles in the centers to add glitter. I hand cut the stems and leaves from some yellowy green papers that my 3 year old had blended! I love these hay bales! 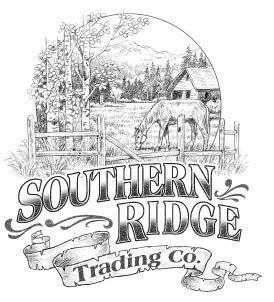 We spent a lot of time as kids on my cousin's farm and they bring back lots of good memories! I added a bit of Stickles to the hay and corn after fussy cutting, but don't forget you can download the SVG outlines at the PCS Store to make it super easy-peasy! Inside, a bit more of the Distress Ink blended paper with another awesome sentiment! Here's a closeup of the whole stamp set! Thanks so much for joining me today! Don't forget to pop over to the store to see all the amazing sets just waiting to be created with! 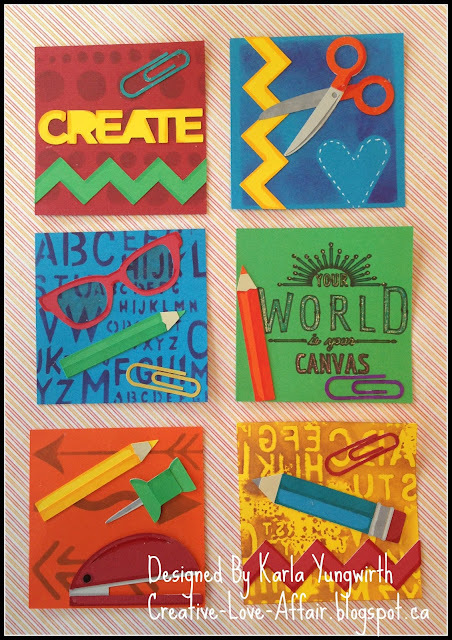 Scrapping Everyday Miracles - August Challenge!